Carel was taking me to see a cemetery (I love them. I know, I’m weird) and as we were driving there he saw an old mill. I’d expressed interest in seeing an old one – the new ones look just like the ones Im familiar with from the windfarms in California. We stopped and walked to it; in the base of it is now a feed store, which I thought was wonderfully appropriate. 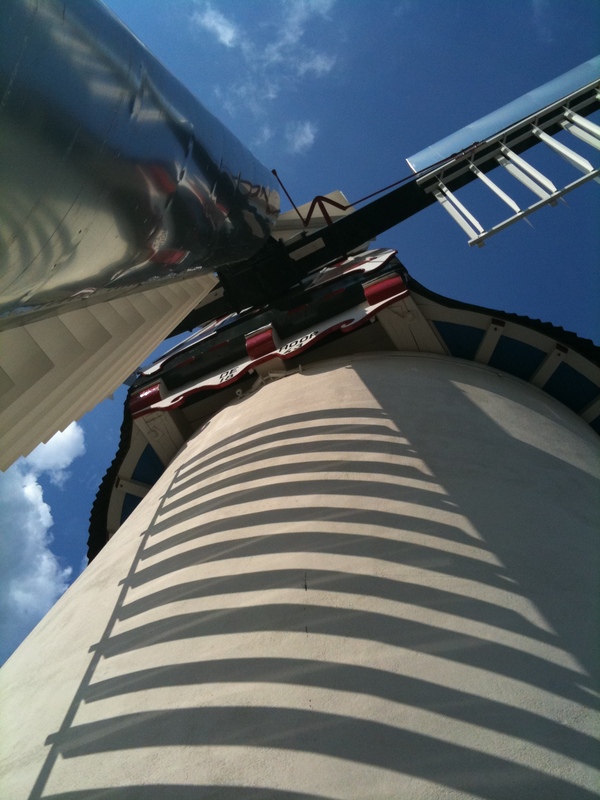 We were looking around and the owner of the store bustled up to us and told Carel that the mill operator (miller?) was just out but would be back momentarily, and we were welcome to go up and look around. Well, yes! 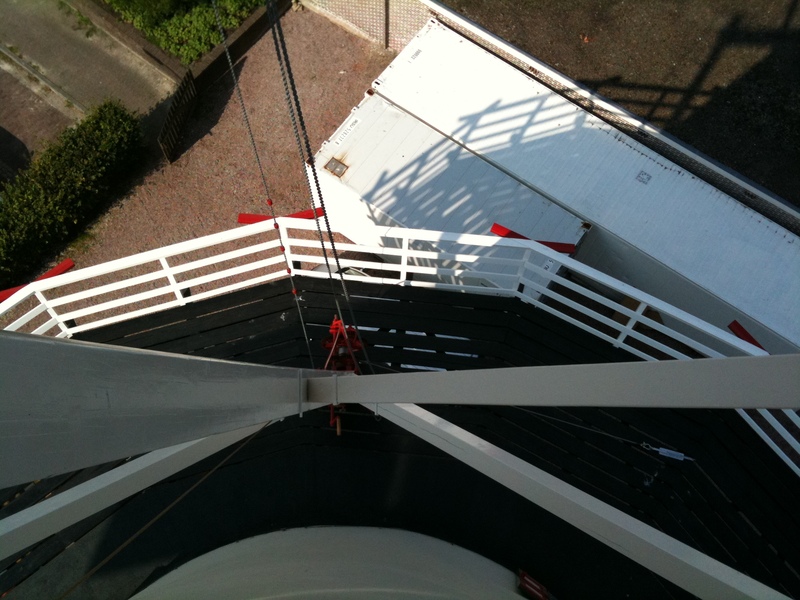 So we climbed up the very steep stair that was more like a ladder, and walked out onto the wrap-around deck to look at the vanes. They are absolutely enormous and made a lovely sound as they rhythmically swooped round and round; it was quite hypnotic. As we stood there admiring it, the miller showed up and introduced himself, smiling broadly. Carel asked him to speak English for me, and he apologetically explained that his English isn’t so good and if Carel could please translate…? 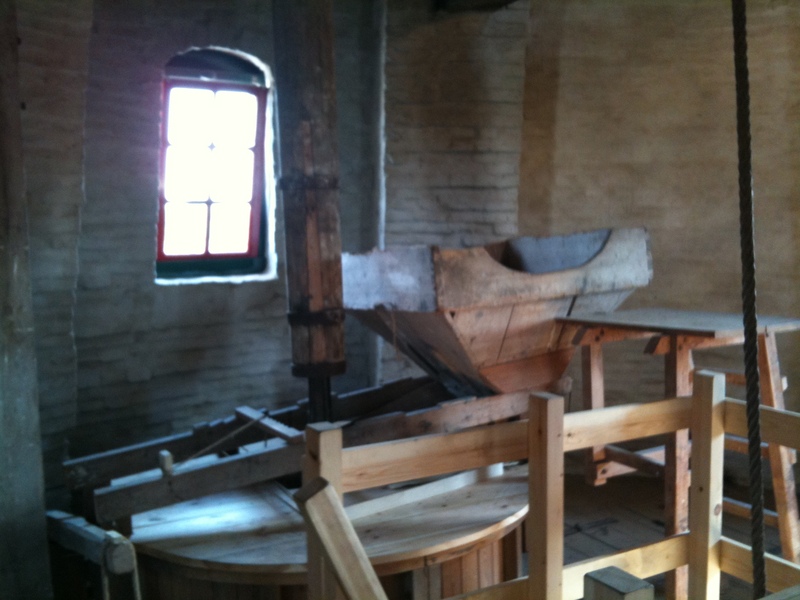 So I got the story of the mill in snatches of hasty English and some random Dutch that I managed to understand. The mill is 150 years old and therefore quite young as such things go, but has been fully restored thanks to a 200,000 Euro bequest from a local who died not long ago, so that while the vanes are now made of metal with some very clever British engineering added, the interior is still all wood. He actually stopped the vanes so that we could go climb around in the works – something that would never happen in the States (can you say liability?). In order to stop it, he pulled a chain that opened the …vents? I don’t know what to call them. 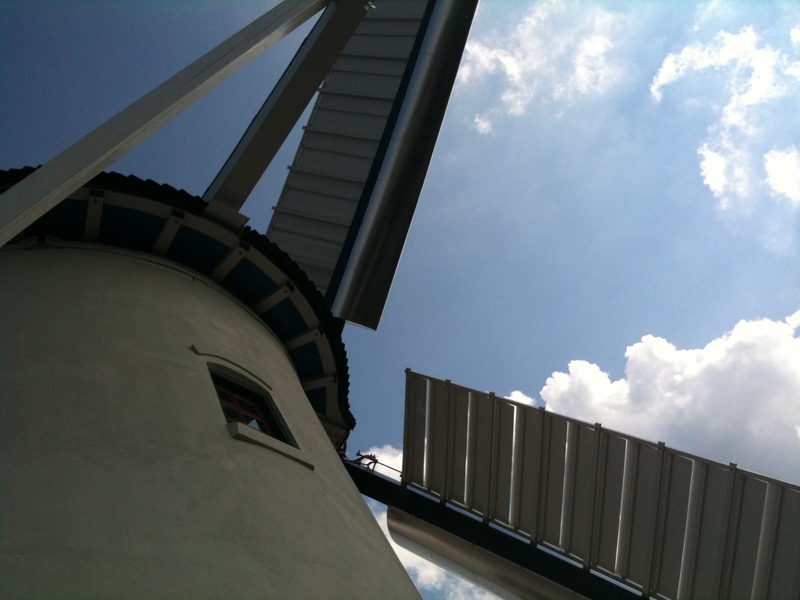 In the first picture they are closed, and in this one they’re open to reduce the air resistance and thus slow the mill. This is important because if it goes too fast, the friction can set the mill on fire. When it slowed enough to be safe, he walked out and grabbed one of the vanes and chained it down so it couldn’t get away. We got to climb all the way up to the very top and see how it all works; the brakes and cogs and wheels and pulleys and everything! Can you imagine being allowed to do this in America? I even wedged myself into the tiny space at the window just above where the main axle goes so I could look outside. It’s huge. I dared to stick my phone out the window and take a photo looking straight down at the deck. The chains are what he uses to stop, start, and control the vanes. They’re connected to the wooden brakes upstairs. The wooden ring with the dark band in it is the brake “shoe”. Pulling the chain closes the brake around the wheel. The big rusty beam is the only metal in the mill. 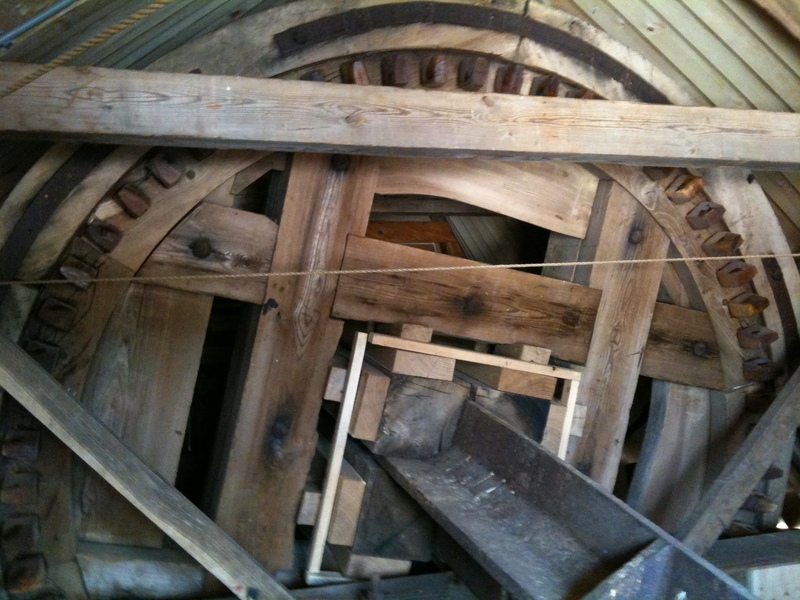 The wooden wheels and rings and cogs all require grease to keep it moving smoothly and to reduce the friction. Between the friction and the explosive qualities of grain dust, fire is a constant worry. That’s the miller, who is a volunteer (and is a postman in his day job). He was so enthusiastic about it that it was just delightful to listen, though I only understood about 1/4 of what he said. 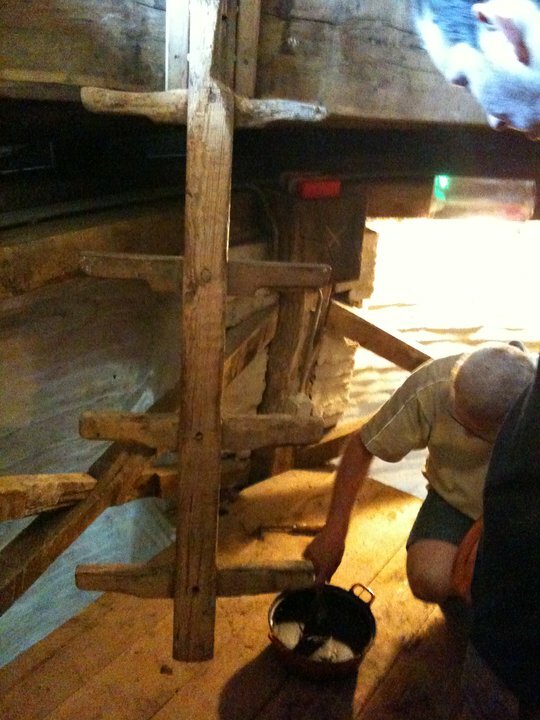 Here he is next to a really old ladder, showing us the method used to grease the wooden rings. They use animal fat for the rings, and beeswax for the cog-teeth. 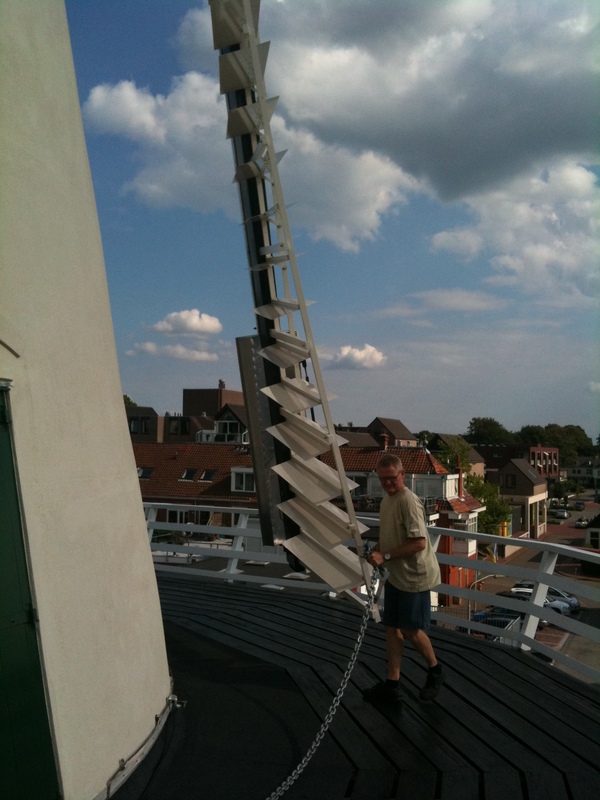 They even use wind power to haul the bags of grain up to the hopper – and at 50 kilos apiece, that’s a nice thing not to have to do by hand. It gets pulled up and then pushed onto the little ledge next to the hopper, and then spilled in. The chute is kept in constant motion by another gadget that’s attached to the primary axle. The shaking of it prevents the grain from jamming up and keeps it flowing. The stones have to be removed periodically and new milling surfaces chiseled in. They use a giant metal pincer that has a couple of protruding rods that fit into matching holes in the sides of the stones, then lift them out – again using wind power, flip them over and repair the surface with a hammer and chisel. The miller could have gone on for hours, he said so himself (and as it was we spent about an hour and a half with him). His enthusiasm was contagious and just a lot of fun. 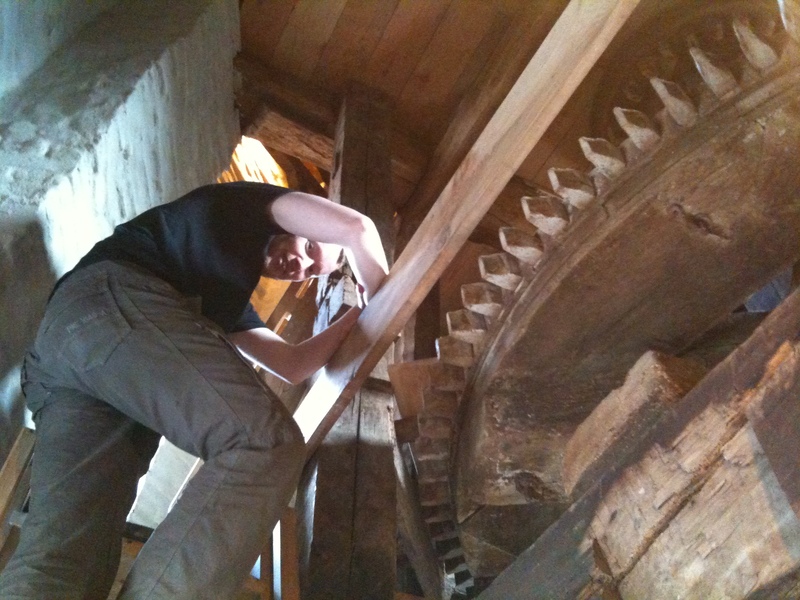 I’d love to go back when the milling begins, which will be soon since the restoration is nearly complete. It’s open and running Friday afternoons and evenings, and in the winter will be fully lit and likely to be a marvel to see. This entry was posted on August 14, 2010 by Coyote. It was filed under observations, photography .